If you want to gather as much information as you can get about IT security, then the IT security certification program which is now available at Brainmeasures can help you out. This IT security course from Brainmeasures aims to satisfy the desire of all its participants to receive high quality information related to the field. With the help of this online certification course, you get the chance to receive a more comprehensive IT security training which allows you to gather information about the many things that you can do to protect all the major components of the IT infrastructure of an organization. Brainmeasures IT security certification course allows you to learn more about IT security online including the most basic principles and procedures involved in implementing effective security policies. 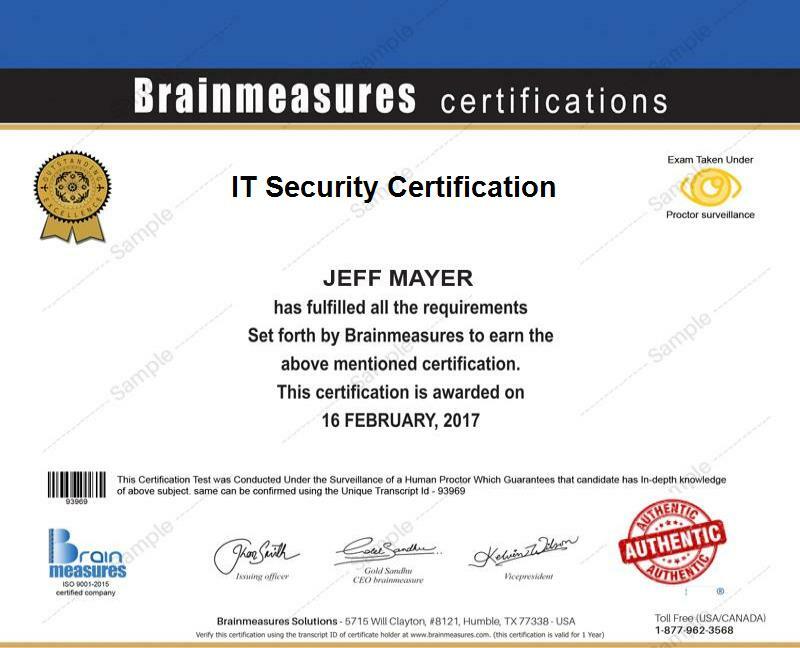 Before you will receive your hard copy IT security certificate, Brainmeasures will evaluate your knowledge and skills about the field through its online IT security exam. If you pass this test, then you can finally start working as a certified IT security expert. The IT security certification program offered by Brainmeasures is extremely beneficial for all types of individuals and professionals who are tasked in keeping all the information, network, systems and elements of an organization’s IT infrastructure secured. This is most suitable for aspiring and existing IT professionals who aim to improve their technical skills and knowledge especially in the field of designing, conceptualizing and engineering highly secure IT and network solutions that can work suitably even across the most complex enterprise environment. As an IT security certification holder, you get the chance to work in high paying positions. If you work as an IT risk and assurance associate, then you can expect to earn around $56,000 to $61,000 annually. IT security certification holders who decided to work as IT security specialists earn approximately $61,000 to $93,000 per year. If you get hired in an IT security analyst position, then you can definitely enjoy an annual salary range of around $48,000 to $142,000. Those who hold managerial positions in the IT security industry also enjoy a stable income within the range of $99,000 to $138,000 annually.